Review Sony Ericsson takes moving to the music literally with its motion-sensor based “shake control” track-changing gadgetry. But there’s far more to the HSDPA 3G-enabled Walkman W910i phone than slick moves. The W910i's slick sliderphone design also nods firmly in the direction of Sony Ericsson’s W880i slimline candybar - reviewed here. At 12mm thick, the W910i is a relatively skinny slider, although with a large face - 99 x 50mm - to accommodate a sizeable display. This 240 x 320, 262,144-colour LCD also employs motion-sensor technology: in media mode, the phone switches orientation automatically between portrait and landscape views as the phone’s tilted - just like Apple's iPhone, reviewed here. It’s interesting to see Sony Ericsson and Nokia adopting this technology in the wake of the Apple handset. Aside from its motion-sensor slickness, the W910i’s spec follows a familiar formula of quality music player and a spread of decent multimedia features that’s made the Walkman phone brand such a hit. This particular one has HSDPA 3G - plus quad-band GSM/GPRS/Edge - which ups download and surfing speeds. There’s no Wi-Fi here, however - you’ll have to check out the new 8GB-packing W960i if that’s what you’re after in your Walkman. Despite beefing up the shooting capabilities of recent Cyber-shot phones, Sony Ericsson has been parsimonious with pixels on this Walkman model. The camera on the back is a basic two-megapixel shooter that does without a flash or photo light. It does do video recording at 320 x 240 pixels (QVGA) at 15 frames per second, and there’s a secondary, lower-quality camera perched above the display for video calling. The W910i is a surprisingly lightweight 86g, and with its tactile rubber-feel casing, feels comfortable in the hand. 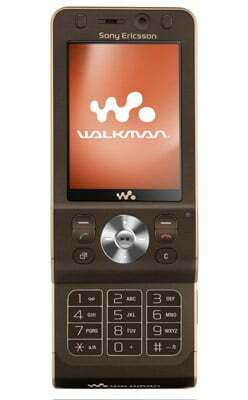 It comes in several colour options – noble black, hearty red or Havana gold, depending on network – that thankfully go easy on the trademark Walkman phone orange. The slider action is smooth and solid, while the keypad beneath is makes efficient use of large keys arranged in a no-nonsense grid. Some may prefer them raised a little higher, but we found them perfectly fine for texting. The display dominates the front of the closed phone. Beneath this you get a silver navigation control that’s also marked up with music player keys. A familiar arrangement of soft-menu keys and call/end buttons flank this, while there’s the regular Sony Ericsson menu key and a Clear button. Above the display are two unmarked keys. In standby mode, they whizz you straight to your latest photos or full camera album, broken down month by month according to when snaps were taken.